New Year, new resolutions and new YOU! First of all wishing all of my ZaikaZabardast readers A very Happy 2013. Hope this year will fulfill all your wishes to fulfill your few or the list of resolutions. Last year I had like tons of resolutions and goals that includes calling my parents at least 2 times a week, make homemade pasta, learn how to make dumplings, make your bread from scratch (well if pizza dough and focaccia counts), eat organic(50-60%) and other baking related goals that I actually never even tried but I think that’s all right. At least I accomplished 65% of them and I am proud. So did I make any resolutions this year? Yes, I did. My 2013 resolution is that I really want to give my best at anything I do this year, that’s it. That includes focusing on eating proper healthy balanced diet. Healthy rings the bell for Quinoa – protein rich seeds and Oats – fiber rich hardy cereal grain. Both are my favorites. Love fresh oatmeal every morning and love my quinoa pilaf salad too. So wouldn’t that be brilliant to use both in one dish and that to something savory, tea-time snack? Of course it is a brilliant idea! That’s exactly what I thought after reading a Crunchy Quinoa Granola post from TwoPeasandtheirPod. I am sure their granola is out of the world but you can’t call me a foodie if I do not tweak other recipe and give it my own touch, right? 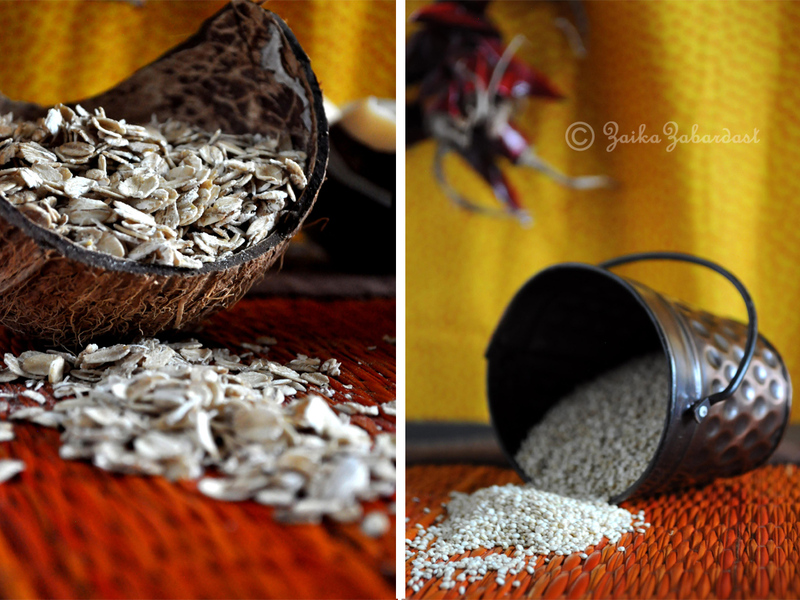 So here I present you the most amazing healthy, light and flavorful snack of all the time – tadaaa! This recipe is very versatile, you can literally add in anything you like. Total time: About an hour but it’s worth it! Rinse the quinoa under cold water and drain well. Even if it says pre-rinsed, rinse it again. In a large bowl, combine dry ingredients. 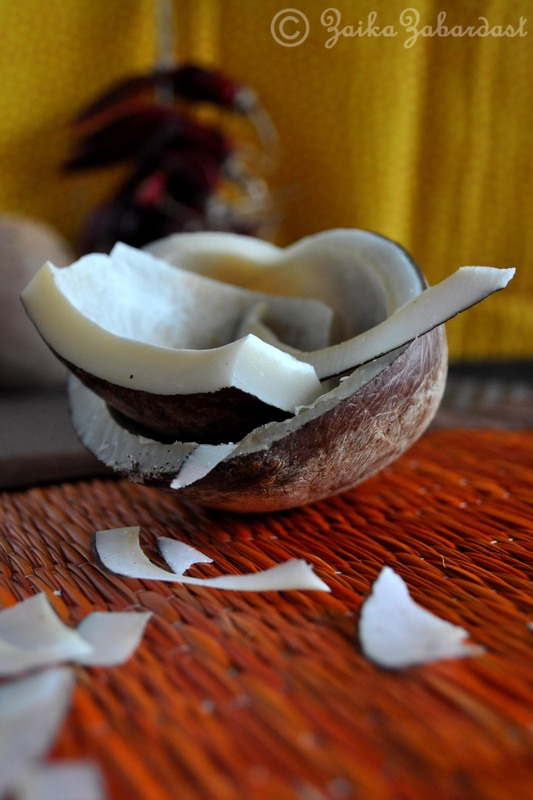 Except shaved coconut. In a small bowl, whisk together olive oil, lemon juice and honey. Add in all the spices and mix well. Add dry mixture to wet and mix everything nicely. Bake for 35-40 minutes, or until granola is golden brown, stirring every 10 minutes or so just to make sure it doesn’t burn the top. When it is at last 10 minutes add in shaved coconut and cranberries. Mix well and bake for another 10 minutes. Let granola cool completely. Enjoy with evening tea. Store in an air-tight container if there’s any left. So How do we like it: I will give it two thumbs up because of the healthy grains and curry flavor, but Mr. V thought that it can use some more crunchy texture so I think next time I am going to add in some rise krispie cereal and that will do the trick. But overall I love the flavors and texture. Question: So did you make any resolutions this year? Would love to hear if you wouldn’t mind sharing! this looks absolutely mouth watering, I really want to make this, maybe even today! Just wanted to say that I really like your blog!! You do such an awesome job, wonderful photography!!! And you look so pretty, I am always happy to get your ‘letters*, although I don’t always have enough time to savor or try out everything. But hey, like you, I make NYR, so maybe 2013 I will cook more Zabardastish! Wishing you a richly blessed, healthy and creative New Year! 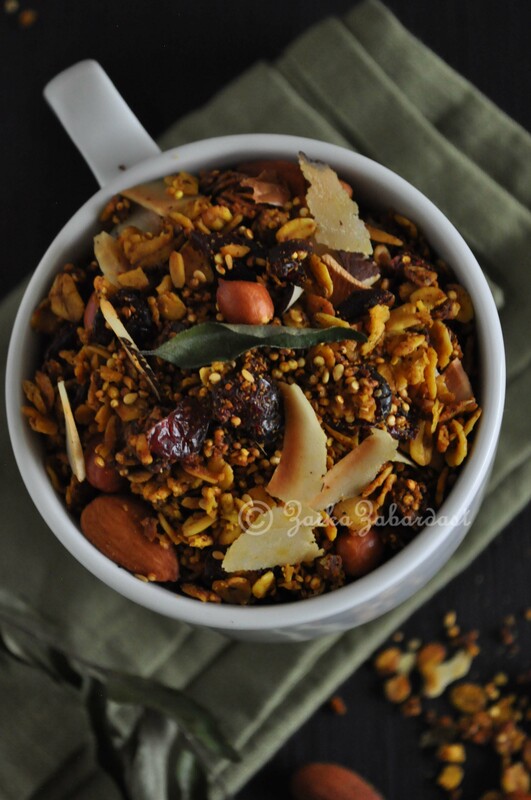 Your granola is beautifully textured & varied in ingredients that I love. Granola is just the best…homemade that is…for snacking, adding to yogurt, cookie recipes & I even toss mine into biscuits! Thank you for sharing your recipe. I am adding curry & quinoa to my next batch. Looks amazing, a perfect snack. And the curry quinoa granola looks delicious. 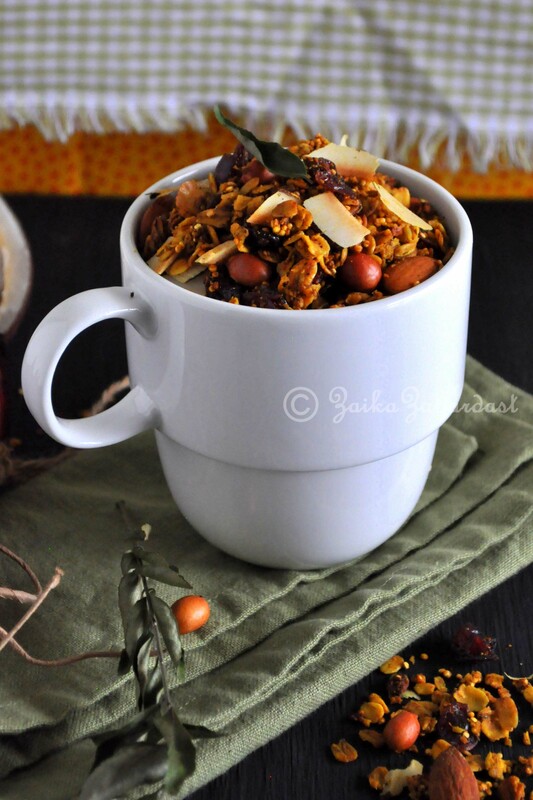 I recently tried a garam masala granola – so good. Your recipe sounds even better.